1. Eat! Don’t go to that game day party hungry, or you’re sure to be vulnerable to overeating! If you find you’re just a little hungry before the big game try snacking on some veggies and hummus or fruit and cheese before leaving to tide you over. 2. Get moving! Not only will this make you feel better, it will also help you have more fun. Studies show that being physically active can actually improve your mood. So don’t be a party pooper! Get some exercise in before the game, and you’re sure to liven up the party! 3. Treat yourself! Upon arriving, identify your favorite dish. This is your “must eat” item – the one that meets your eye and will not stop beckoning you until it’s in your mouth. Don’t deprive yourself of this treat! Simply give yourself a reasonable portion, truly enjoy every bite, and allow yourself to be satisfied. Moderation is key! 4. Prepare something healthy! You can make sure there is something nutritious to chomp on at the party by providing something nutritious. 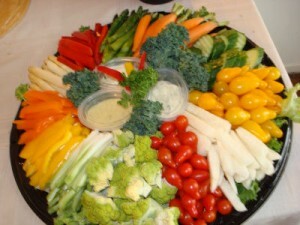 Cut up some veggies like carrots, celery, cucumbers and add grape tomatoes to dunk in a yummy dip. You could always try our Spinach and Artichoke Dip with veggies and whole wheat pita chips. Or our Boneless Buffalo Chicken Tenders with Blue Cheese Sauce. 5. Stay hydrated! With all your friends around, exciting football plays and fun commercials we sometimes forget to hydrate. 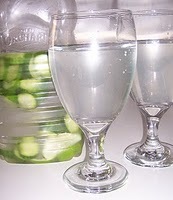 If plain water doesn’t interest you, try adding a slice of lemon, lime or cucumber. Carbonated flavored water is also another great alternative. 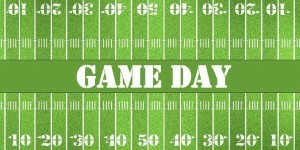 What team are you rooting for on Sunday? I think this has some great advice! I’ve found that although you might get teased for bringing something healthy to the party, it will be gone at the end when people get sick of the fat and sugar that they’ve been pigging out on. Also, a lot of people like to get out and throw around a football during half time. Instead of watching the show – get out there and run around! The super bowl may have gone but the food hasn’t, we tried your recipe for Boneless Buffalo Chicken Tender – it was awesome, thank you. Everybody loved it. You have given us alot of insight.It is a useful piece of information. I wanted to thanks for your time for this! Please keep us up to date. check out this how to cure gout naturally review.